7 years ago, I’ve spent around $200,000 on a product that never took off. That was my own money, earned from outsourcing, and I’ve learned some expensive lessons down the road which I’d like to share with you today. You’ve got an idea for a new online business, you’ve set aside some money and you are eager to get started. But how can you maximize your chances of succeeding with your new venture? How can you avoid the mistakes I made without squandering a fortune and actually get nothing in return? Does your market require a product comparison feature on the website? Does your market need to see similar product recommendations? Does your market require an air cleaner sizing calculator based on the room size? Does your market require product filtering by price, brand, color and rooms size or maybe other attributes? Does your market need to pay with Bitcoin or only with a Credit Card? But if you build a smaller-scale website, which starts satisfying a decent number of customers, that’s the moment when your business is fitting your market. Better said: that’s when you are finding the product/market fit. How do you know whether a feature is crucial and needs to be included on your website? Is it just a nice-to-have feature? Will this new feature move you towards a better website? Will it just be a “distraction” in your website development, thus make you waste money? How do you know in which order you should build features? Note: the order is important because there will be a cutoff on your capacity related to building your website and you need to ship a useful website and start selling before you run out of money. The approach I’m talking today about shows you how to build a Minimum Viable Product using WordPress and a Scrum-inspired Agile approach. When you are a small business owner, there are several ways to test whether your idea could work and be of interest to prospect customers. The one I think it’s the most effective is to see if there’s some traction for your idea. Specifically, this approach is based on actually deploying a very simple, stripped-down version of your website with just enough features to satisfy early customers. The goal is to get valuable feedback for your future development. Let me explain the Venn diagram a bit more. What your market needs (green circle) - this set has all the features that your market would ever need to solve a particular problem on your website. It includes both crucial as well as nice-to-have features. Most of the time, even your market is not aware of the features it needs :) That’s why you need to work hard to uncover them. What you think the market needs (blue circle) - if you are like me, you’ll assume there are a lot of needed features on the website and the overall set might be bigger than what your market actually needs. Please note that there are some features your market needs which you are not aware of yet. Therefore, there’s only a partial overlapping of the green and blue circles. What you can afford to build (yellow circle) - you certainly don’t have an infinite amount of money to spend on building your website. Most of the times, this circle will be smaller than what your market needs. But hey, don’t despair, your market needs both crucial as well as nice-to-have features, so you might want to focus on the crucial features and spend less money. 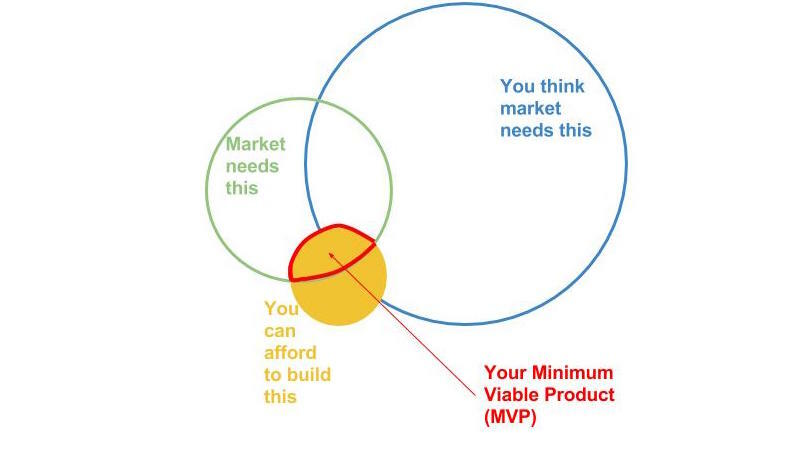 Your Minimum Viable Product - MVP (the red area) - it’s the set of features that makes your website take off. Therefore, your mission here is to find out what those “just enough” features are for you to start generating some traction. Quick ways to measure traction could be the number of visits to your website or landing page, form submissions, the number of downloads or even payments. Your WordPress-based MVP should be as simple as possible, but no simpler. As you will learn all the above only by building an MVP website, this will be much cheaper and faster than building the full solution in the first stance. You will get results and relevant feedback at a fraction of the budget used for building the full-featured website in one shot. Are you working on your MVP website? Hire Marius Vetrici and his team to benefit from the Agile WordPress development approach! www.caregivercareers.com, a Caregiver Job Search website. Initially, it started out as a WordPress-based with WooCommerce Subscription website. It was a relatively quick build. But later on, as the business matured, the website owner kept the website on WordPress but switched the subscriptions to Infusionsoft CRM. www.luxurybuystoday.com, a Social CRM website for lead generation. This website was built on WordPress for a faster launch. At the same time, there’s been a second team working on a larger Laravel-based project with 10x more features. The WordPress-based MVP project’s goal was to start generating leads and getting early feedback from customers, which would all help to lead the development of the bigger project. www.babaa.me, this was a WordPress-powered concierge service for the Brazilian market. The initial WordPress-based MVP didn’t get enough traction and the service was shut down before spending a fortune on building an expensive platform. One of the things that make WordPress a powerful software is, without any doubts, plugins. You can find a WordPress plugin for pretty much anything business-related. Therefore, it’s quite easy to start by combining one another and try to get you most of the features you need. The list could go on with thousands of other WordPress plugins. Remember the Lego style I quickly mentioned in the heading? Well, using a combination of the above plugins, along with others you might need, borrows the idea from playing with the Danish toy bricks. In fact, by assembling, switching, and setting up together different “pieces” you can get 80% of what you need in less than 20% of the time and budget usually required to build a comparable solution from scratch. The process is similar to what my 2 kids do with their Legos. They take parts off from 3 different sets like, for example, one Lego kit to build a police station, one for a fire rescue vehicle and one for a submarine. Then, with all these parts they try to build something completely new, like a starship :) For them, that will work, and most importantly, it will be good enough to have fun. Same goes for you as this approach will be good enough to get some traction. It’s not all sunshine and rainbows here. Actually, there’s a huge caveat you should be aware of. Although the Lego bricks are of the same quality, unfortunately not all the WordPress plugins are created equal: some of them are very good, others are just fine, but there are also some others that, well, are just plain crap. To overcome this limitation, you can read some reviews and comments around the internet. But, if you ask me, a more thorough approach would involve hiring a WordPress expert for assessing the WordPress plugins’ code you’d chosen before moving on to something serious. After you’ve successfully built your (lovely) MVP website, which probably solves 80% of your business requirements, there will come a time when you’ll want to move your website even further and add the missing 20% of the features. Now that you have a working MVP website, and you have some real traffic data from live users, you certainly know more about what has to be built. You could just go ahead, hire a WordPress developer and add all the features from your list. Or you might want to approach this in an Agile manner, that is, to build the next layer of the most valuable features to gather new feedback from your user base. For this, you’ll need a WordPress team with a consultative approach, who will guide you throughout the process, help you take the best decisions based on your business goals and, ultimately, build it for you. Further on, I’ll describe the Agile process that we’ve used with great success, but before that, let me familiarize you with the Agile terminology. A User Story is a thin-sliced feature describing what has to be achieved, usually following this format: As a [user role], I want to [goal/desire] so that [benefit]. Here’s an example for an eCommerce website: As a Customer, I want to push the “Add to favorites” button on the Product page so that I can save this product for later reviewing or buying. Another example is: As a Customer, I want to see on the Product page a tab named “Technical Specifications” which will contain a simple text so that I can read all the technical details of this product. Once implemented, a user story will add a fully functional feature despite its small size. More info on user stories here. The Product Backlog is a list of all the features (User Stories) you will ever want to build in your website. You don’t have to build all the features in the Product Backlog, however, you might want to have a complete inventory at hand when choosing the one we will be developing. A Sprint is a batch of development hours (eg: 20, 40 or 50 hours) with a set of expected User Stories to be delivered. This is a list of User Stories you chose to work on during this sprint. The Product Owner is the person that’s part of the development team who has the overall view of the project and who has in mind your business priorities. She/he will be also in charge of the communication between you and the team. There are other terms in the Agile vocabulary, but for the sake of simplicity, we’ll only focus on the ones above. Now, let’s dive into the development process you should expect for getting the best out of your MVP WordPress website. We do an initial consultation with you, explaining the Agile approach if this is something new to you as well as its advantages and limitations. We take time to understand your business goals. We assess if the project lends itself to an Agile approach. We agree upon the length of the sprints and discuss the overall project budget. We start the sprint by requiring you to make the deposit for the first batch of hours to Codeable escrow. We interview you, we document your requirements as User Stories and compile the Product Backlog. Remember? The Product Backlog is the list of all User Stories (features) you might want to build later on. We keep the Product Backlog in Asana. See the Tools section below for more info. We help you prioritize the development effort by reordering the User Stories in the Product Backlog by their ROI. We do this by labeling every Product Backlog item with Small/Medium/Large and then we ask you to answer the following question for every item in the Product Backlog: “How much money will this feature make you during the next 12 months?” If the ratio between feature size and feature value is low, then this is a low ROI feature and we deprioritize it. If, however, we have a high-value feature per effort, then we move it to the top. Now that we’ve reordered the Product Backlog, we choose the top N features for the next Sprint and we move them to our Sprint Backlog. We plan the sprint in our calendar managed with Harvest Forecast and we mark the deadline for the planned User Stories in Asana. See the Tools section below for more info. We work on creating the features. As the development takes place, we keep detailed time sheet reports using Harvest time tracking tool. We regularly update you via Asana regarding the progress that has been made. You review the delivered features and provide feedback. When you use your website even unfinished, something magic happens and you start gaining very valuable a lot of insights about the way to go further. When the planned features and/or the budgeted hours are finished, the sprint is ended. We meet with you over skype/phone to review what has been done, we collect final feedback for the sprint. We will normally ask you to test the new features with real users if possible. We reorganize together the Product Backlog by eventually adding any new User Stories. We start a new sprint by continuing with point #3. We repeat this until your business goals have been attained at a sufficient level and/or the allocated budget has been consumed. As promised, here are the tools we are using for the above-mentioned Agile WordPress development process. Asana for storing the Product Backlog, for managing the Sprint Backlogs for every sprint and for communication with you. Hence, we’ll need you to regularly login to Asana and reply to our comments. Alternatively, we can use Trello or a similar tool if you have a specific preference. Harvest for time tracking and reporting the time spent on the work. This is a tool we are using internally. Harvest Forecast for planning the workload and calculating the deadlines. This is a tool we are using internally. I shared the above tools just as a reference. You, as a potential client, will only be using Asana. You focus like a laser beam on the top features and leave aside all the other nice to have features. You have full control over the development process through Asana task management and timesheet reports. You get the sense of how it is to work with your WordPress team quite quickly so you keep the risks under control. If you don’t get anything valuable after one or two sprints, you might want to consider changing the team you are working with. Better prioritization - you gain visibility over what has to be done based on a working variant of your website, you do usability testing rather than guessing what will actually work. Budget control - you can stop the project after any sprint shall you decide to do that. You will still get a functional website even though it might not contain all the features. You will maximize the business value you are getting out of your invested money because you are only choosing the features with top ROI for your website. WordPress acts as a powerful tool when it comes to quickly building a Minimum Viable Product (MVP) for your future website project. In the WordPress ecosystem, you can find pretty much anything you need whether in the form of a theme or a plugin. Beware though, not all plugins feature the same level of quality as the best ones. That’s why, if you really want to use them for your MVP, I’d advise you to have a WordPress expert to review their code. When you power WordPress up with an Agile development approach, you’ll gain early visibility over your website, plus a chance to test what actually works rather than just wandering in the dark trying to understand what might work. This early valuable feedback will help you better prioritize and get the most out of your given budget, which will translate into a higher ROI for you. And who doesn’t want that when it comes to business? This is a great way to work though this! Remember, you can always add more features to a well built, simple websites. But trying if you try to cram features in, and create an unstable product, you won’t be able to add any features to it. Another thing to think of: you should prototype the CMS aspects of WP too before committing to them. I’m glad you find it useful Deepti. I agree with you one should make sure WordPress itself is the right solution for your future website! WP covers quite a lot of requirements, however it is not an all purpose Swiss Army knife. I agree with you too. But as I commented in this post, WP is a powerful tool to build a prototype or a MVP. It doesn’t work with any business model but it’s cheaper and faster to launch something until it gets to product/market fit. After, people can move to something more suitable to their business needs in the same way we did with our company. It’s much more expensive and takes a long time to get ready. Just to add another point of view, lots of people are using WP with this purpose because, in theory, it’s very easy to setup and manage, there are tons of plugins and cheap “powerful” Themes available. But lots of those people don’t have the basic skills needed to run and manage a MVP built with WP. I think it’s worth adding that it’s not so much what the market needs, as much as what you’ll be able to sell (some of them) given the current market. That is, there is typically a delta between actual need and the current mindset and expectations of the market. Steve Jobs was exceptional and making leaps across that delta, and thus altering the market. However, most biz owners / developers are not Steve Jobs. MVP is a way to mitigate risk, test assumptions, probe the market, and perhaps, eventually, move that needle a bit. The problem is, too many people think they are Steve Jobs and/or they will be able to communicate – in a noisy TMI world – to the market why their new way to slice bread is soooooo much better than the old way. Perhaps it is. But getting that point across is no easy task. I have one more thing to add: build only the essential features to get started and everything else run as a concierge. We did customer support in both sides of the marketplace (demand and suppliers), collected payments, user onboarding and lots of other work stuff as a concierge. This concept is called MVP concierge. I recommend it to everyone because it is very powerful. It was the best choice we did because we had the opportunity to learn a lot from our customer’s concerns and pains, to evaluate all the process and/or features our platform needed to be built and our business workflows. We’ve launched our MVP 100% built on top of WordPress. We’ve taken only a couple of weeks to launch the first version of Deskovery, a marketplace of coworking spaces. All we built was only the coworking space listing, basic searching features and one Custom Post Type to store coworking spaces’ information. Everything else we used was built-in WP features such as user registration, login, password recovery and some plugins. I remember that our team discussed a lot if we shouldn’t develop a frontend form to allows people to publish their space information. We were worried if users would know how to publish via WP admin and other UX stuff. (Yes, everybody was redirected to WP dashboard after create an account). We run our WP-based MVP for 1.5 years and we never had any issue related to it. We after realized that almost all coworking space managers was already able to use WP because most of their websites was WP powered. Another concern we had was about moderate or not space publishing. Again, we decided to leave everything as simple as possible and allowed coworking space managers to publish their space’s information. The only thing we’ve built was a small script to notify us via email everytime a new space was published just to check if everything was filled in the right way to avoid our website to looks broken (such as forgot to set featured image that was used in the listing pages and search results). I don’t remember if we blocked any space published so I guess it may happened a very few times. The fact is that you can do almost anything with WordPress. There are tons of plugins available out there. But if you don’t find what you need, build it yourself. It’s open source! Back to the topic, after lots of iterations and learning a lot from our customers, we’ve realized we should build a custom platform. Then we rebuilt it entirely with Laravel and VueJs. In a few weeks we will also release our crowdsourcing backed mobile app built with Lumen (a lite version of Laravel that runs our API) and React Native. I hope by sharing my experience I could help anybody. Feel free to ask any questions within this thread. Great post, btw! Just added this blog to my Feedly! This is a very usefl post! I’ve been building my website with one of 20 Mind-Blowing WooCommerce Portfolio Themes For Your eStore in 2016 from https://www.templatemonster.com/blog/20-mind-blowing-woocommerce-portfolio-themes-estore-2016/ and I need to improve my knowledge in marketing. The only thought I had was to try a direct mail advertising, but it encompasses many marketing materials and costs a lot. So, I’m glad that I’ve found your article, it has enlightened me. Thanks a lot!